Provisioning a target or test computer is the process of configuring a computer for automatic driver deployment, testing, and debugging. To provision a computer, use Microsoft Visual Studio. A testing and debugging environment has two computers: the host computer and the target computer. The target computer is also called the test computer. You develop and build your driver in Visual Studio on the host computer. The debugger runs on the host computer and is available in the Visual Studio user interface. When you test and debug a driver, the driver runs on the target computer. The host and target computers must be able to ping each other by name. This might be easier if both computers are joined to the same workgroup or the same network domain. If your computers are in a workgroup, we recommend that you connect the computers with a router rather than a hub or switch. Provisioning virtual machines through the WDK's automatic provisioning process is not supported. However, you can test drivers on a VM by setting up the target VM manually as described in the step by step echo lab. On the target computer, install the operating system that you'll use to run and test your driver. If Secure Boot is enabled on an x86 or x64 target computer, disable it. For information about Unified Extensible Firmware Interface (UEFI) and Secure Boot, see UEFI Firmware. If the target computer uses an ARM processor, install the Windows Debug Policy. This can be done only by Microsoft or the manufacturer of the target computer. You do not need to disable Secure Boot. On the target computer, run the WDK Test Target Setup MSI that matches the platform of the target computer. You can find the MSI in the Windows Driver Kit (WDK) installation directory under Remote. If your target computer is running Windows Server, find the DriverTest folder that was just created by WDK Test Target Setup MSI. (Example: c:\DriverTest). Right click the DriverTest folder, and choose Properties. On the Security tab, give Modify permission to the Authenticated Users group. Verify that the host and target computers can ping each other. Open a Command Prompt window, and enter ping ComputerName. On the target computer, in Control Panel, go to Network and Internet > Network Sharing Center. Note your active network. This will be Public network, Private network, or Domain. On the target computer, in Control Panel, go to System and Security > Windows Firewall > Advanced settings > Inbound Rules. In the list of inbound rules, find all Network Discovery rules for your active network. (For example, find all Network Discovery rules that have a Profile of Private.) Double click each rule and open the Scope tab. Under Remote IP address, select Any IP address. In the list of inbound rules, locate all File and Printer Sharing rules for your active network. For each of those rules, double click the rule, and open the Scope tab. Under Remote IP address, select Any IP address. Now you're ready to provision the target computer from the host computer in Visual Studio. On the host computer, in Visual Studio, on the Driver menu, choose Test > Configure Devices. For Network host name, enter the name or local IP address of your target computer. 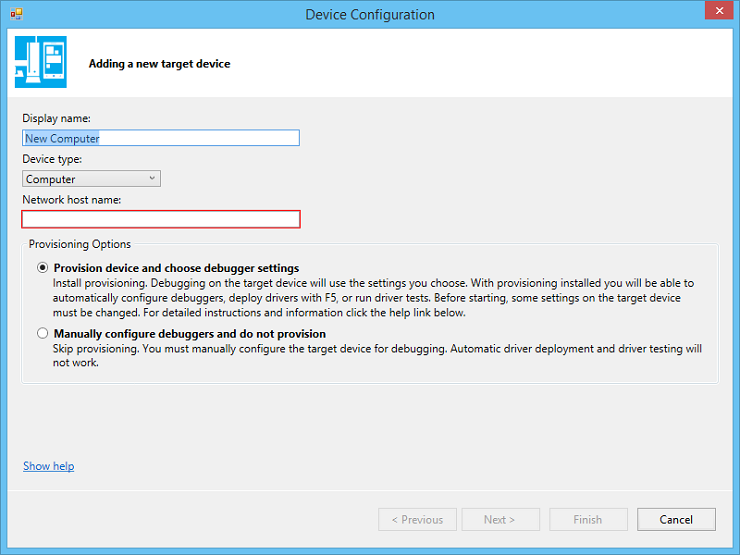 Select Provision device and choose debugger settings. Select a type of debugging connection, and enter the required parameters. For more information about setting up debugging over various types of connections, see Setting Up Kernel-Mode Debugging Manually in the CHM or online documentation for Debugging Tools for Windows. The provisioning process takes several minutes and might automatically reboot the target computer once or twice. When provisioning is complete, click Finish.